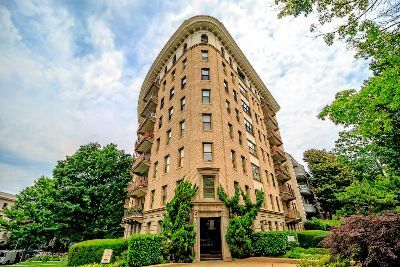 In the posh Washington, DC neighborhood of Kalorama—known for its historic addresses—is an opulent building known as The Carthage. Dating back to 1921, this elegant eight-story Beaux-Arts building was renovated in 1980 and converted to 28 luxury condos for sale. The Carthage is located at 2301 Connecticut Avenue NW at the corner of Connecticut Ave and Kalorama Road. The building is listed in the National Register of Historic Places and is also in the Kalorama Triangle Historic District. Interestingly, The Carthage itself has a somewhat triangular shape, with rounded corners. It was designed by Ernest C. Hunter and G.Neal Bell who were prominent architects of the era in DC. Other nearby historic residential buildings of note include 2029 Connecticut and 2101 Connecticut. Set well back from the street and surrounded by large manicured lawns, this grand old structure is home to two one-bedroom units and 26 larger two-bedroom units, ranging from 1,484 to approximately 2,000 square feet. Condos for sale have recently listed between $465,000 for one of the smaller one-bedrooms, to $1.5 million for a large two-bedroom, three-bath residence. Step inside one of these lovely city homes and you’ll witness true old world charm, with original hardwood and marble flooring, formal dining rooms, wood-burning fireplaces with lovely mantles, crown molding and distinctive door paneling. Most of the units also have large private outdoor terraces. The spacious kitchens have been updated with granite counters and stainless steel appliances, while the renovated baths feature granite vanities and frameless showers. The pet-friendly building has a doorman, staffed front desk, concierge service, secure parking, a clubroom, a business conference room and a roof desk with sweeping views. 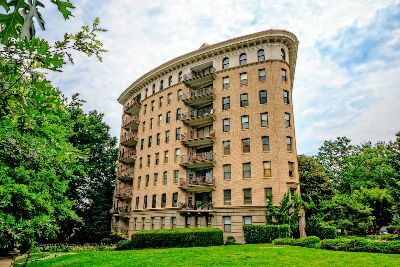 The location is also a huge calling card, just a couple blocks from Kalorama Park, with the trendy 18th Street Restaurant Row in Adams Morgan just four blocks away. For more information about The Carthage, call District Partners Real Estate, LLC at 202-798-3600.